In preparing the new database Xiubao Sun and colleagues from the CMA say they addressed a number of problems with other surface temperature databases, in particular the relatively poor coverage of stations across Antarctica, Africa, South America, and Asia. They note that the IPCC AR5 report concluded that the warming trends in these regions are associated with a lower confidence level. They also improved the absence of early period stations, especially before 1940. Overall, they find that the annual warming was larger in the NH (0.115 °C per decade) than in the SH (0.088 °C per decade). From the early 1950 to early 1970s, however, the SH exhibited an insignificant warming, whereas the NH exhibited a slight cooling. The land warming from the early 1980s was much more remarkable in the NH than in the SH. They add it is also clear that the global mean surface temperature change was largely determined by the NH because there were a much greater number of grid boxes containing data in the NH than in the SH. 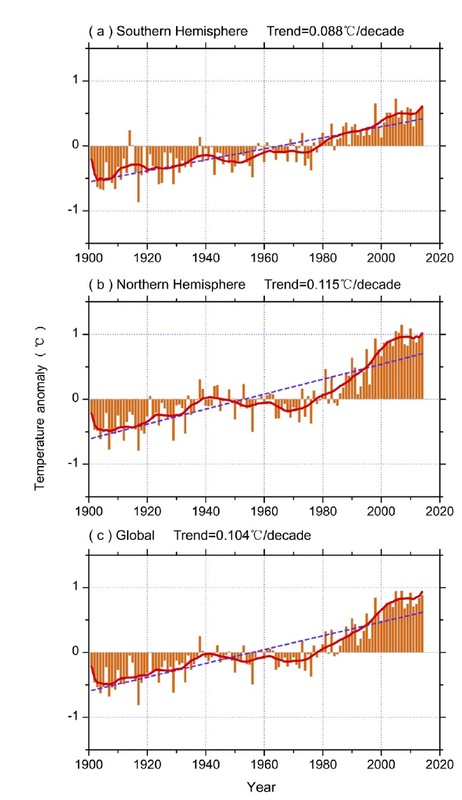 The researchers conclude that from 1979 to 2014, the mean surface temperature anomalies in the SH, the NH and the globe showed annual unprecedented and highly significant warming trends, reaching 0.138 °C per decade, 0.317 °C per decade and 0.247 °C per decade, respectively. 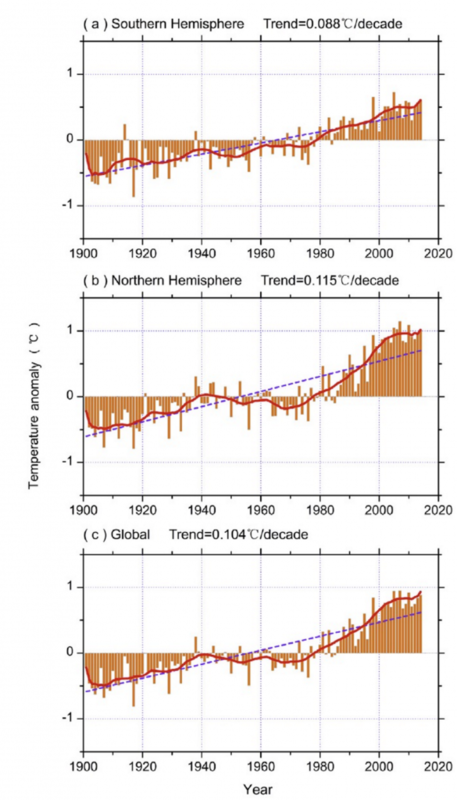 From 1998 to 2014, however, he two hemispheres and the globe experienced the ‘‘warming hiatus”, with the SH, NH and global lands registering insignificant warming trends of 0.087 °C per decade, 0.105 °C per decade and 0.098 °C per decade, respectively. During the recent ‘‘warming hiatus” they note that a high incoherence in global surface temperature changes can be seen, with the abnormal warming in Arctic areas neighboring the Eurasian Continent and North Atlantic Ocean and remarkable cooling in North America, East and Central Asia, northern Australia and southern Africa. The slowdown of climate warming, they say, seems to mainly occur at the low and middle latitudes of the hemispheres, and especially in the boreal cold season.